This year's Halloween was absolutely the scariest, most horrific, ghoulish Halloween I've ever had! 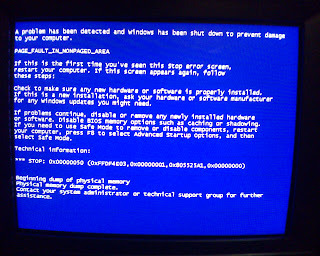 I was spooked by one of the worst monsters ever: the blue screen of DEATH! Now, you've got to admit: that's scary! I confess I'm still recovering from the fright. Still sorting out what that monster destroyed. Grrrrr! The rest of Halloween was pretty fun, actually. Click on any of the images to see them a little bigger. We got our decorations up in plenty of time for once, so we displayed a festive Halloween theme. Trust me, it looks much better at night. The glass bricks had an orange glow, of course the jack-o-lanterns were lit from within, and I have little orange LED lights wrapped around the bars. It's hard to see, but each little step has its own light, which I covered with orange gel. I even drew little spider webs on each one, complete with a dangling spider, using a black Sharpie pen. Hand drawn! 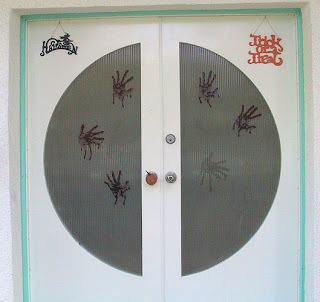 I especially liked our little touches, such as the bugs crawling around on the house number, and the crime scene tape stretched across the front gate. Unfortunately, one of them kept falling off. You know, there's nothing quite as annoying as having your bloody hand keep falling off. 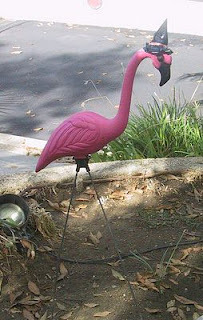 We got so into the Halloween theme that even our flamingo was garbed in a witchy costume! Eat your heart out, all you ghosts and goblins. Flamingos rule! 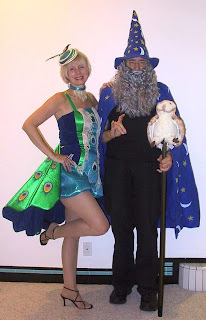 Now let's talk about the good stuff -- costumes! Yayyyyyy! Robin recycled the Halloween costume he wore last year since he liked it so much. He's really into the magic thing. Me -- I did something a little different. I was disguised as a peacock! 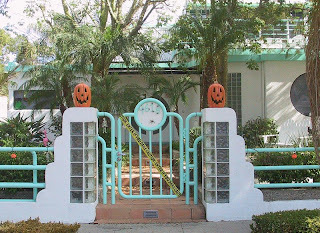 We attended the Halloween party at our favorite clubhouse, the Magic Castle in Hollywood. When I arrived, I learned something about my costume. It's funny -- anywhere else in the world, I would be simply a peacock. But in Hollywood, I was THE famous NBC Peacock! One guy came up to me and did a big double-take. Then he exclaimed, "Whoa! You look really different on TV!" Then he did another double-take like he just couldn't take it in. He was hilarious. Did I mention that my costume was convertible? Check it out! I hope your Halloween was as fun as ours.